The meaning of the term design is constantly changing. Every generation develops their own understanding, from useful functionality to luxurious beauty. Many young designers are now deploying design as a form of social and political intervention. Traces #1: Beyond Generations toont hoe generaties ontwerpers de afgelopen 70 jaar visies ontwikkelen en het vakgebied veranderen door met elkaar in gesprek te gaan. Rond acht kernthema’s worden hun dialogen tastbaar gemaakt. Werken uit de collectie van het Van Abbemuseum fungeren als maatschappelijke en culturele spiegel. De acht kernthema's zijn: professioneel beeld, democratische ruimte, sociale transformatie, systeemdenken, vrije vorm, conceptuele reflecties, verhalende ruimtes en mens zijn. 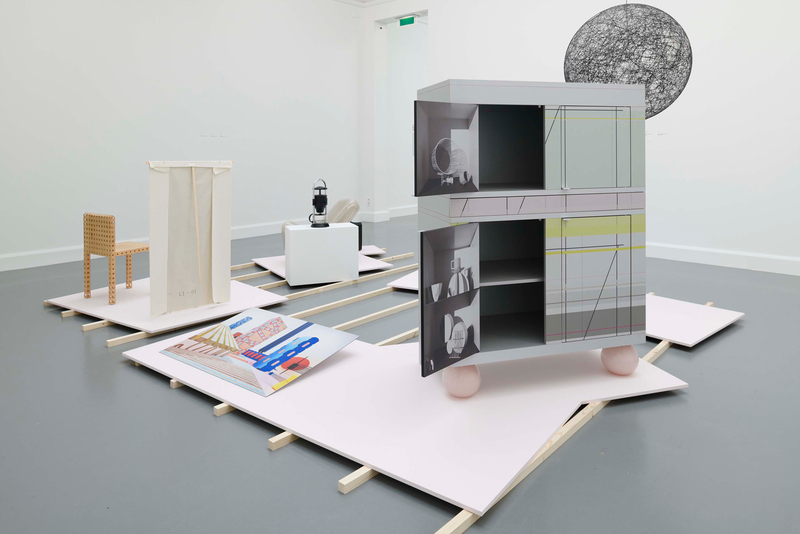 With the exhibition series Traces Design Academy Eindhoven will spend the next five years investigating the traces the academy has left in the city, region, nation and the world; and in the design field itself. Traces #1 Beyond Generations demonstrates how over a 70-year period new visions were developed by generations of designers through continuous discussion with one another, which in turn kept changing the profession. These dialogues are materialised around eight core themes. Art works from the museum collection reflect the social and cultural environment in which the dialogues unfold. The core themes are as follows: Professional Image, Democratic Space, Social Transformation, System Thinking, Free Form, Conceptual Reflections, Story Spaces and Being Human. In three galleries, the dialogue even escapes into associative conversation: a major driver of change. In these rooms there are several dialogues between designers. Most designers share the desire to be unique. But, consciously or unconsciously they stand on each other's shoulders. It seems as if they are engaged in a conversation about mutual ambitions; even when they are decades apart. Others cherish their controversy to clarify their own positions. Who watches and listens carefully, can tap into the buzz and discover the associative links between objects and approaches. It reveals how the history of design is created by dialogue. Maarten Baas, Gerrit van Bakel, Aldo Bakker, Gijs Bakker, Max Barenbrug, Anthon Beeke, Lou Beeren, Jurgen Bey & Jan Konings, Madeleine Bosscher, Peer de Bruijn, Sarah Charlesworth, Ilse Crawford, DE MAKERS VAN, Jan Dibbets, Piet Hein Eek, Kiki van Eijk, Niels van Eijk, Axel Enthoven, Envisions, Dan Flavin, Formafantasma, Joost Grootens, Hacking Households (Leonardo Amico, Thibault Brevet, Coralie Gourguechon, Jesse Howard, Jure Martinec, Nataša Muševič, Tilen Sepič), Dave Hakkens, Frans de la Haye, Simon Heijdens, Bart Hess, Niels Hoebers, Teun Hocks, Richard Hutten, Hella Jongerius, Chris Kabel, Gijs Kast, Jos Klarenbeek, Imi Knoebel, Sigve Knutson, Dirk van der Kooij, Paulus van Leeuwen, Sol LeWitt, Thomas Lommée, Lucas Maassen & Margriet Craens, Isabel Mager, Gabriel Ann Maher, Christien Meindertsma, Ulf Moritz, Christiane Müller, Reineke Otten, Bertjan Pot, Bas Princen, Scholten & Baijings, Jan Slothouber & William Graatsma, Wieki Somers, StoneCycling, Studio Job, Studio Maarten Kolk en Guus Kusters , Studio Makkink & Bey, Studio UNITT, Minale-Maeda, Super Local (Luc van Hoeckel, Pim van Baarsen), Martin Visser & Joke van der Heijden, Marcel Wanders, Rachel Whiteread, Marijke van der Wijst.